Cambridge Econometrics’ analysis for the European Commission, adopted last week by DG Justice, assesses how future residential solar PV (photovoltaic) capacity in the EU is likely to be affected by electric vehicle (EV) ownership and renewables policy. The study ‘Residential Prosumers in the European Energy Union’ carried out by a consortium including Cambridge Econometrics (CE), found that an increase in the number of households with electric vehicles will lead to a projected 5-40% increase in installed solar PV capacity by 2030. It also found that a phase-out of policy support for solar PV across the EU could significantly limit growth of installed capacity, in some countries freezing new investments in residential solar PV in the short term. CE developed a new spreadsheet-based model of consumer behaviour to estimate future solar PV investments under a range of assumptions about the level of subsidies available, growth in EV markets and EU trade policy. The modelling approach accounts for the fact that consumers are motivated not only by financial incentives, but also by a multitude of other factors including their perceptions of time requirements and disruption related to installing solar PV, environmental values, desire for greater autonomy and prestige, current trends and fashions. It also accounts for the fact that consumers’ tastes and habits are diverse and different consumers attribute different values to these non-financial aspects of solar PV. 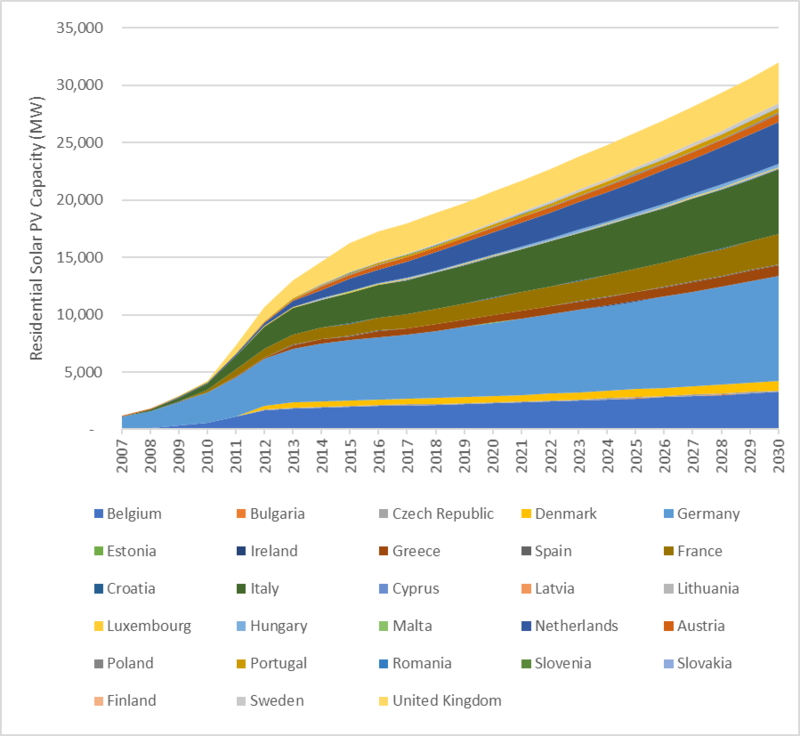 One of the interesting findings from the study is that, for nearly all of the countries modelled in the EU28 high take-up of EVs would have a positive impact on residential solar PV capacity installed. The effect is relatively small over the period to 2030, because it takes time for EVs and battery storage technologies to penetrate through the stock and, in many countries, the proportion of ‘attractive’ solar PV investments that do take place, are very low. The impact of the EV growth scenario is most positive in countries that receive little benefit from exporting electricity to the grid (as this scenario allows much higher levels of self-consumption to be reached).